There a quite a few Bible Journal reviews on this page. Please let us know if there are other Bibles you’d like us to review. If you purchase a Bible using our affiliate links, we may receive a commission. Thank you. Your purchase helps keep our site running! Curious which Bible is right for you? 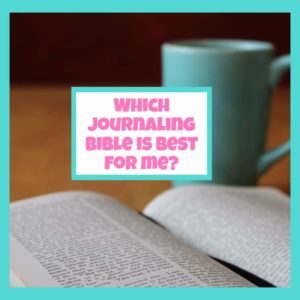 Watch our videos to find out and then head over to our Bible Journaling Selection Quiz to help you finalize your decision. Purchase this Bible at DaySpring here. The One Year Chronological Bible Creative Expressions, Hardcover: Here at ChristianBook.com. NLT One Year Chronological Bible Creative Expressions,Softcover: Here at ChristianBook.com. You can find this Bible or one similar to it at Christian Book.